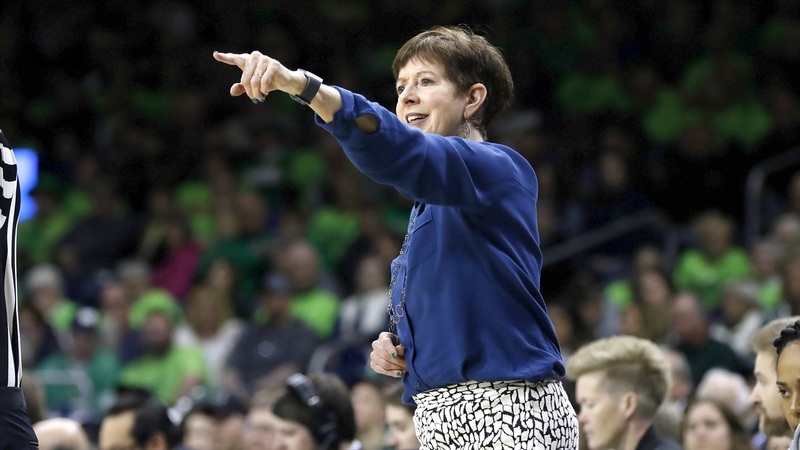 Notre Dame head coach Muffet McGraw took part in the Women’s Final Four teleconference on Tuesday afternoon. Q. Was there a point during the season, a specific game, where you thought you really may be good enough to get to Tampa and compete for the national championship? MUFFET McGRAW: Honestly, we won a tournament in Vancouver over Thanksgiving, played three ranked teams, played very well. I thought at that point when we get healthy, because Marina Mabrey was just coming back, I knew we had a good team, a lot of talent coming back, certainly had a big target on our back for being defending champ. But I think it was evident pretty early on that we had the talent to get here. Q. Your guards are basically the heart and soul of your team. They like to play at a frenetic pace. You want an up-tempo game, don't you? Q. You and Geno both were at the same place, talk about your roots there in Philadelphia, how it helped you become the coach you are. MUFFET McGRAW: Absolutely. I think Philadelphia was a great place at one point. The Big 5 in its heyday, so many great men's coaches there. The women's coaches were following suit. Cathy Rush, Immaculata, national champs. It was not a big football area. None of the schools really had football in the city. It was all about basketball. I think a lot of playing pickup, just having the camaraderie with all the other women in the area and all the coaches. I mean, everybody just really got along really well. It was fun place to be. Q. You were at Saint Joe's a year apart. Did you have any kind of relationship, you and Geno, before you became the head coaches of the schools you were at? MUFFET McGRAW: Yeah, we did. Through Jim Foster mostly. He was good friends with Geno when I came on. We had some interactions at that point. Then he went down to Virginia I think for a while, before he went up to Connecticut. We've known each other for, gosh, I don't want to say how many years, it's been a long time. I think obviously playing in the Big East together, we saw each other quite a bit. Q. I asked this of the other three coaches. In regard to the issue of abusive language, things that coaches say, especially in the circumstances with the ACC having one coach who lost her job, another who is suspended. Have you found that you've had to change ways that you communicate with players from when you were a player and how challenging is that? MUFFET McGRAW: I think first it is incredibly challenging. I think it's an emotional moment when you're in a game. Even in practice. I mean, I think for coaches, I don't think people can appreciate the kind of stress we put on ourselves, how we're always looking for perfection, how we're constantly going over the same things over and over again. You have expectations for yourself, you have expectations for your program. When you get to a point where you're not sure if you're meeting them or not, I think it puts even more of a burden on the coach. I think the emotions get the best of us. I think this generation is not tolerant. That's not a bad thing. But back in the day, coaches could pretty much do anything, say anything. Nobody really complained. Now they know better. They're demanding to be treated better. As far as the language, I think probably the women are very similar to the men. I don't think there should be a double standard as to how they talk. But women as players expect a different thing. I think male players probably can take a little bit more in terms of language. It's a tough situation I think for everyone. I don't think it should ever border over the line and go into abuse. I think kids are going to get yelled at. They need to be able to take a little bit of that. Q. This is one of the great rivalries in sports now. This will be your 50th time playing UConn. Are there specific things from that first matchup that you look at and say they apply going into Friday's game, or the fact it was several months ago isn't really that relevant? MUFFET McGRAW: No, I think it's relevant. I think you can always look back and see some things that you did, see some things that they did. When you're watching the recent game, they're still running that or not running that as much. They changed some defenses, playing things differently. It's always good to have that foundation. We don't know them quite as well as we used to. It was good we were able to play them earlier this year to see how that was going. Williams, that was the best game of her career. I don't think we'll find a better game on film to watch to see how good she can be. I think we can take a lot from that game. Q. I know you're not playing Oregon, but we talked to Kelly Graves this morning about being the newcomer. He said, They had to win the first one first. Reflect back on your first Final Four, first championship, how different it feels now, if it does feel any different? MUFFET McGRAW: Well, the first one always is special when you get there. You don't know what to expect. Everything's new. You're kind of giddy about everything. Oh, I have to do six hours of media, I can't wait to get there. It's so exciting to be here. I think when you've been there a couple of times, you try to find some ways to have your kids continue to have fun. It becomes so much more businesslike. You don't have a lot of free time. I think in that way, just knowing what to expect helps a little bit. I don't think it ever gets old knowing you're in the Final Four. Q. How good is it for college basketball? You and UConn have been there back-to-back, Baylor is back for the first time since 2012, Oregon from the west? What does that say about women's basketball to have that kind of variance? MUFFET McGRAW: I thought the Pac-12 had a great year. They are a terrific conference. To have them be represented in the Final Four is a great accomplishment, especially seeing Oregon for the first time. They're a team that everybody has been talking about all year long. Certainly Sabrina is one of the highlights of conversation no matter who you're talking to about women's college basketball. She's had a phenomenal year. I think people are going to be excited to see her. Q. If you talk to teams that are No. 1 at the beginning of the year or teams that essentially are anointed as finalists before any of the games happen in any sport, coaches will tell you sometimes there's a real mental weight that players have to endure throughout the year, the weight of expectation. Even though your group got to where it wanted to go, the Final Four, did you see any signs of that this year given so many people at the beginning of the year anointed you guys as a team that was coming back no matter what? MUFFET McGRAW: Yeah, that's a great question. We definitely felt that I think throughout the year. To be pre-season No. 1 was something I thought weighed a little bit heavier on us. We came out, we played okay early in the season. There were times in January when the season just seemed like it was so long. I think the team was fast forwarding to March. This is kind of boring, could we just get to the tournament. We lost our focus a little bit I think. Definitely the pressure probably helped a little bit, knowing that you're supposed to win every game. Where is the fun? Where is the excitement? Where is the joy? And we lost that. We actually met about that right before or after Christmas. I think it was before Christmas. We talked about that. We got to have fun again. We're not having enough fun. We did some things a little bit differently. I think we just came in with a new attitude. I think that helped. Losing a couple games that you're not supposed to lose is really good at regaining your focus, so we were able to do that. It's almost like a relief when you get to the Final Four, when you're in that position, the whole year, people keep saying your name as somebody that's supposed to be there. That makes it a little bit harder, too. I am thrilled, of course, to be here, but also I think a little more with relief than excitement. Q. During the tournament I saw your team, if you want to use the phrase play a little bit freer and without stress than they did at other times early in the year. Would you agree with that? MUFFET McGRAW: I thought the ACC tournament was as well as we played all year. We played great basketball. We won games by a pretty good margin. We had a lot of fun. It was exciting to win. We got to the first and second round. I thought same thing. In the Sweet 16, I thought we started to get a little tight again. Actually I thought in the Stanford game, Abby Prohaska came off the bench and gave us this huge lift. She makes a basket. I saw everybody on the team smiling on the floor which they don't do very often. We needed something to break the tension. So I think that was it. The Elite 8 game I think is one of the toughest games because there's so much pressure to get to the next one. Q. Since the loss to Miami, 13 straight, 12 by 16 or more points, what changed from that Miami game through the rest of the season? Do you think that was a turning point for the team to get to the Final Four? MUFFET McGRAW: It was definitely a wake-up call. We lost to North Carolina, but Jackie Young didn't play. In the back of our minds we had a little bit of an excuse. That probably wasn't a good thing. We lost to Miami with a full roster. Now we had to take a good, hard look in the mirror and say, What is going on here? I think it was great for us to be able to refocus. We came back and I don't think -- we won by a pretty comfortable margin the rest of the way. I think it was between that, that point in the season, where March was suddenly very close. You could see it coming. We didn't have the grind of January, which we did during the North Carolina game. We had a little more focus because we could see the finish. Q. Can you talk about how this team is different from last year. You returned a lot of players. That's obviously why everybody expected you to be back here. How have you changed, gotten better? MUFFET McGRAW: Well, the biggest difference is Brianna Turner. Her defensive presence, I think she's the best defensive player in the country. She was the ACC Defensive Player of the Year. She changes the game inside for us. We're not a great defensive team and she makes us better because she's a shot-blocker in the back but can switch out and guard the point guard. She has made us a lot better at the defensive end. Offensively she's playing above the rim, which nobody could do last year. There were times last year when we would be looking for ways to get that weak side pin, throw the ball inside. Jess Shepard is a phenomenal post player, but she's more of a power player than Brianna. I think Bri helps our break. We have somebody in there that can get 10 rebounds a game. We're much better in that way. We also lost two really smart, good passing post players. That has been probably the thing we've been trying to sort of regroup on. Q. Is there a different kind of confidence with this team because you did win it all last year, you know what it takes? MUFFET McGRAW: I think we're confident, but I don't think you ever can look and say, We did it before. We can do it again, but you know how tough it's going to be. We won each game by a basket. It wasn't as if we were just intimidating everyone. I think going into this one, it's different. The competition is going to be the same in the first round. Two other different teams coming in. I think we're looking at it just as it is: this year, new season, new team, see how far we can go.